LESLEY SCOTT PUBLISHES HER NEWEST BOOK: "CROSSDRESS TO IMPRESS: Timeless Fashion & Style Advice for Crossdressers & Transgender Women"
Lesley's newest book takes her more than two decades worth of experience in the fashion business - from styling photoshoots to trendspotting to penning countless articles on the subject for a wide variety of international lifestyle magazines - and puts everything into one, easy-to-reference place for fine fellas wanting to channel their inner fashionista. Available on Amazon.com, as are the rest of Lesley's books. The article is (obviously) in Japanese. However, here is a summary post I wrote about it plus highlights of the Q&A with the journalist, covering everything from that same gray tee that Zuckerberg wears every day to why I think it wasn't the Seinfeld wardrobe department that is to blame, but the 80s! Plus I include pix of the famous/infamous Marc Jacobs grunge collection in the early 90s for Perry Ellis that got him fired - but was an incredible sign of the normcore times. CLICK HERE to listen to Fashiontribes Daily on Stitcher. To read the rest of this excerpt from Lesley's new book, The Future of You (2014), in Business Buzz, the region's hottest new publication, CLICK HERE. The Future of You is a comprehensive and fascinating look at all the deep trends and mindboggling new technologies influencing and shaping the future of you - in body, mind & soul. Answers is a global platform with over 200 million registered users, millions of monthly visits, strong community interaction and high quality content. For Lesley's "hub" on Answers and links to all her articles, CLICK HERE. FASHIONTRIBES REBRANDS & CELEBRATES WITH A NEW LOOK & A DAILY PODCAST. The focus of course is to help showcase how fashionable the brand known more for its comfort can be. 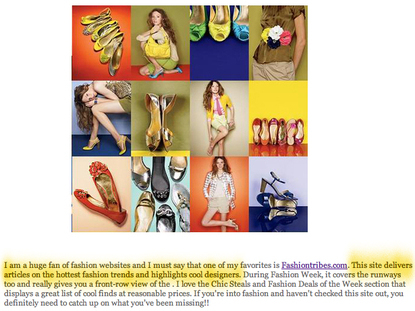 Here is a sample Aerosoles Brand Ambassador post. From placing crystals as nose rings to rings on our toes, we’ve long loved adorning, decorating and embellishing every possible displayable inch. Seventy-five thousand years ago, our prehistoric ancestors festooned themselves in feathers, stylish shells, and protected themselves with necklaces made of shark teeth and twine. When the ancient world discovered metalworking, royals and nobles preened in gold, silver and gems, the style mavens of the status-conscious world of the medieval and Renaissance European courts delighted in being better able to pull sartorial rank on each other. And where turquoise, jasper, lapis lazuli and carnelian had been favorites of the Pharaohs, the Tudor and Elizabethan periods were studded in glittery rubies, emeralds, blue sapphires, black pearls, and diamonds...for the rest, CLICK HERE. The boot brand created a clever promotion that coincided with the glitzy film fest. A few select bloggers were chosen to create Sorel-approved Pinterest boards showcasing how they would envision wearing selections from the Winter collection and then encourage their readers to follow suit. The boards were replicated IRL at the festival. CLICK HERE to read all about it! A Channel Curator for Sulia.com, a hot subject-based social network that connects readers to the top social sources & vetted experts on subjects they care about. 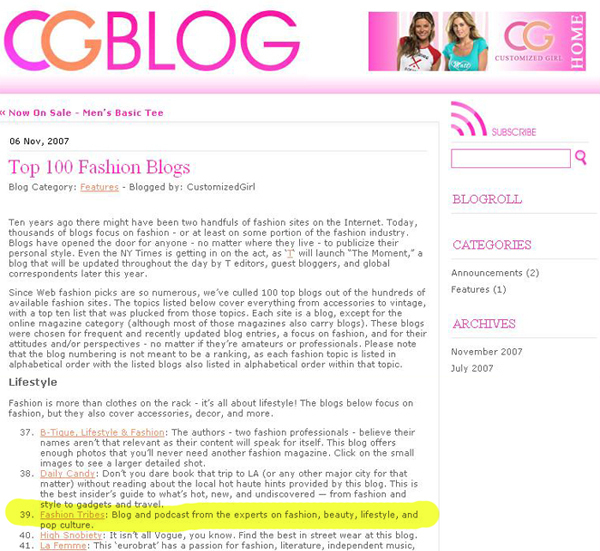 To help the show celebrate its 10th anniversary, Fashiontribes was invited to contribute to the official blog. Much cattiness abounded, carping and delicious sniping about Boris & Natasha. For all the dirty dish, CLICK HERE. Auf wiedersehn! THIS LINK to the seventh challenge includes links to all the JBD challenge posts. For their Holiday 2010 Campaign, the fab folks at Gap asked us to write a piece to be featured on their FB page that riffs on the idea of "Cozy." Which we love, just as long as it's not of the Norman Rockwell ilk. Rather, we prefer our "Cozy" very much like Carrie Bradshaw...right where we can see it: hanging in the closet! We wrote a total of four posts that were featured on Gap's Facebook page. CLICK HERE for the fun one feature a very Carrie Xmas. To test and promote the rebranded skincare line, Lesley was one of a handful chosen to represent the brand in the blogosphere. In addition to testing the products and writing posts and videoblogs, she was flown to NYC for a meeting with the company's team and their advising scientists. HERE is a good sample post about what was involved. FASHIONTRIBES HELPS LAUNCH THE NEW MARC JACOBS FRAGRANCE FOR MEN, BANG! Fashiontribes was chosen as a blogger brand partner for the launch of this fragrance, helping with the social media push. Involved writing four weekly, in-depth editorial posts. THIS POST contains a link to the entire group. Lifestyle Intelligence site Signature 9 recently compared the content quality, popularity and buzz surrounding 250 blogs to compile a list of the 99 Most Influential Style Blogs. 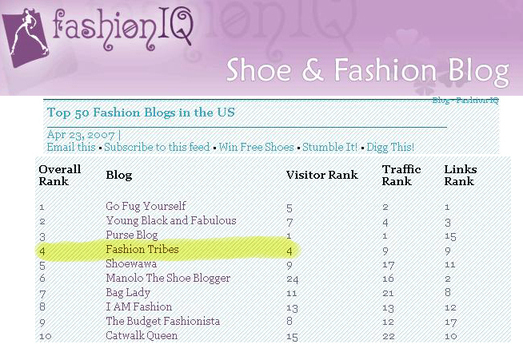 Despite competing against fatly-funded and well-staffed corporate blogs including The Moment (the NY Times fashion blog), FabSugar (part of the Sugar empire), Stylelist (an AOL joint), and Fashionista.com (Breaking Media), Fashiontribes - a true indie blog - was ranked #11! For the rest of the story, CLICK HERE. As an online influencer and trend-setting blog, Fashiontribes was recently selected as a founding member of the Hanes Comfor Crew. Here is what Hanes Director of Digital Strategy, Hilton Graham, has to say: The Hanes Comfort Crew is a network of dynamic and prominent social media influencers who converse with Hanes about comfort, clothing, and community. Hanes went to great lengths to find the best and the brightest in the social media space and is honored to count Lesley Scott among the members of the Comfort Crew. 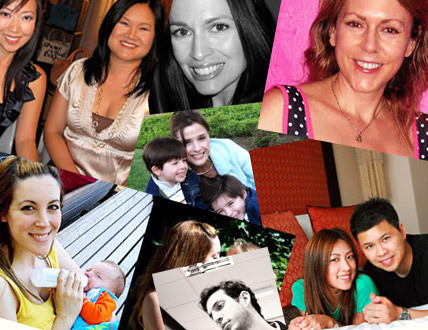 A regular at fashion week and revered for her daily coverage of high-end trends and designers, Lesley brings expertise in social media and style as the founder of Fashiontribes.com. Hanes is grateful for the opportunity to work with Lesley in this capacity. For more on the Hanes Comfort Crew, CLICK HERE. For the deets on being kidnapped by Hanes and Disney World, CLICK HERE. In honor of Season 3 of the wildly popular show The Tudors, we were invited to guest blog about fashion inspired by the show. As the rockstars of their day, the Tudors knew how to dress to impress. CLICK HERE to check our our Tudors-inspired picks for modern fashion royalty. For our post on the Pop Tudors blog, CLICK HERE. Time is money, so where should you spend it? Globetrotter Suzanne Aaronson wondered the same thing, and in her quest to pull together a go-to list of the best of everything from around the world with which to enrich her life, she quickly developed a reputation among her high-flying friends of being the go-to gal for everything fabulous. She turned her special knack into Suzanne's Files, a site devoted to the best of everything everywhere - as recommended by her golden rolodex of savvy, interesting types dubbed her "Insiders" - of which yours truly was recently added to the roster. "These people are my eyes and ears around the globe," explains Aaronson. "A well-traveled and well connected network that offers firsthand insights and unbiased opinions to add color and breadth to the files." 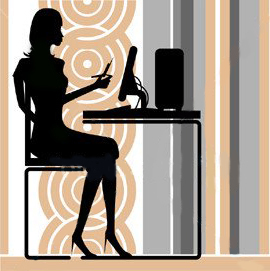 To check out Lesley's profile on Suzanne's Files, CLICK HERE. If you're lucky enough to have laid hands on a Kindle e-Reader, now you can access all the Fashiontribes daily deliciouness wirelessly. All the blogs featured on the Kindle are auto-delivered, so you don't have to do a thing...other than sit back & catch up on all the latest fashion dish. Order your subscription at Amazon.com. 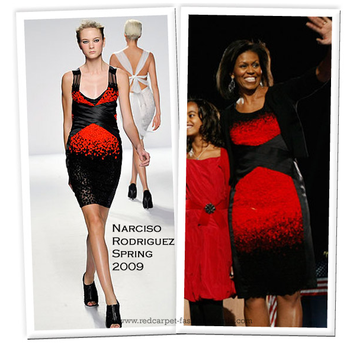 When we deemed Michelle Obama's Narciso Rodriguez dress less than flattering, noting that "the normally impeccable Michelle O made a questionable choice for her husband's historic Election Night victory," our dressing down of the typically chic First Lady Elect created quite the buzz around the Web! Reuters featured the post, as did The New York Observer, Yahoo! NEWS, About.com, OrlandoSentinel.com, Boston.com, USA Today Lifeline Live. Several of NBC national affiliates featured Michelle Obama Election Night Dress Misstep in the Around Town section, including: NBC Around Town New York, NBC Los Angeles, NBC Washington, NBC Dallas Fort Worth, NBC Connecticut, NBC San Francisco Bay Area, NBC Chicago & NBC Philadelphia. Numerous blogs and well-read forums also featured the piece, including My It Things, Tigan Family Blog, GWRRA.org, Life As I Experience It, and Eve Community ars technica openforum. And now the Web is truly world wide, it even made appearances in France (Le Post), Malta (TimesOfMalta.com), Bulgaria, the Phillippines (Business World), in Japanese (Excite), in Portuguese on Yahoo! Noticias Brasil, in Vietnamese on Vietfun for All, and in French at CyberPresse.ca. 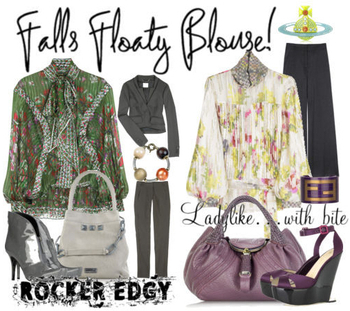 The blouse is one of fall's key pieces, and the Argus Leader newspaper wanted the scoop on how to rock it like a pro. "The main caveat with a blouse is looking too old lady or like a politician's wife," I explain in the piece penned by Janna Farley, advising would-be-wearers to pair their blouses with vintage necklaces, chunky watches, or ankle-length boots. "Try it with one of the season's high-waisted, wide-leg jeans in a dark wash and a fabulous towering platform. Or, for a more rocker chick feel, wear it under a shrunken blazer with a skinny jean and ankle boot, like Kate Moss. If you work in a field where jeans in the office are a no-no, wear it under a sharply tailored pant suit in a menswear fabric, a la Bill Blass." For more on our star turn in the Argus Leader, CLICK HERE. 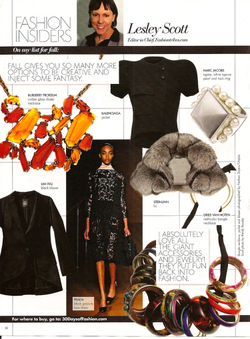 This year's 30 Days of Fashion features a portfolio of Mario Sorrenti's work, plus the fall must-haves coveted by eight fashion insiders....including yours truly! Produced in print as an outsert, it is distributed to over 1 million select subscribers of various Hearst titles, including Harper's BAZAAR, Marie Claire, Oprah Magazine, Town & Country, Cosmo & Esquire. For the full dish, CLICK HERE. At the 2008 Metropolitan Museum of Art Costume Institute Gala, Karl Lagerfeld reworked a design from the Chanel spring couture collection to fit into the evening's theme of exploring the transformative powers of fashion. Oh, those epaulets....those nautilus shell "pockets"...and as I remarked to Newsday, Anna Wintour just needed to "add matching Verdura cuffs and she could zoom off and fight (fashion) crime the world over!" 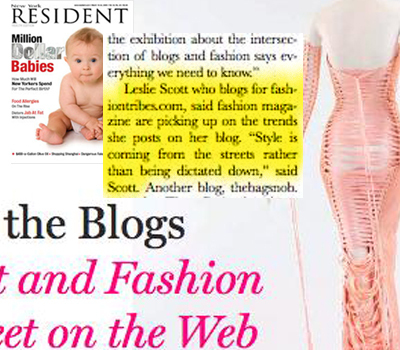 For more on this fun Newsday piece covering blogger reactions to the dress, CLICK HERE. 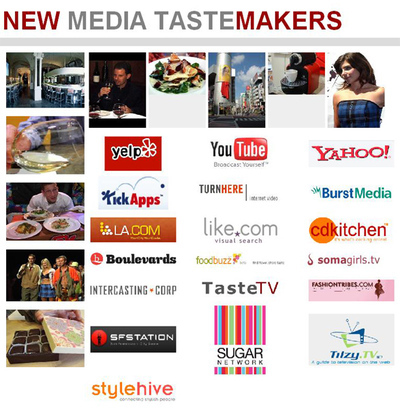 At the recent, first-ever New Media Tastemakers Summit held in San Francisco, Fashiontribes was invited to appear on the elite Digital Fashion panel to discuss influencing and following consumer tastes online. In an interview with Pierce Mattie, one of the most forward-thinking lifestyle PR firms, we discussed why the new media may seem oversaturated, but actually isn't; how summits like this one will probably only become more frequent and popular; and a lil' basic Etiquette 101 for PR peeps pitching their clients to writers & publishers in the Style Blogosphere. CLICK HERE for more about the summit and here for the full Pierce Mattie interview. From natural weight loss, to shopping, to getting the best out of life, the LoveToKnow editors are always on the hunt for accurate and unbiased info and everything we love to know. Along with sites like MSN and Amazon (! 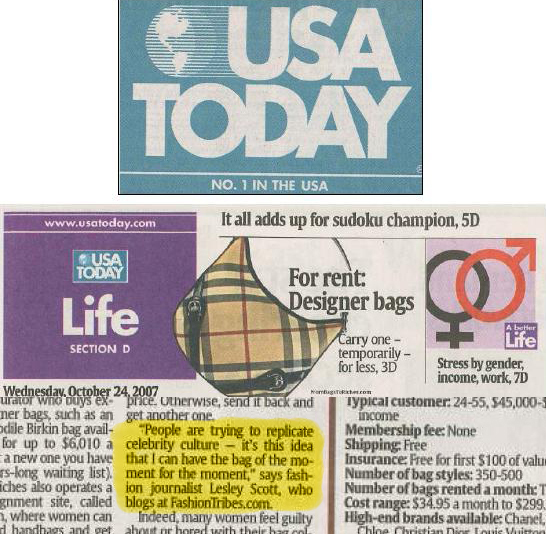 ), they rated FT as one of the coolest places to find some of the best stuff from HSN. For the full list, CLICK HERE. 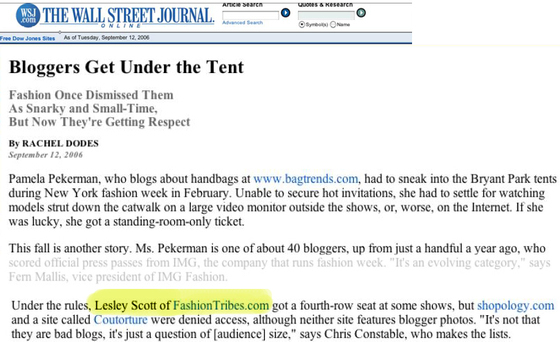 Lesley Scott of Fashiontribes will be part of the "Core Topic" panel Influencing & Following Consumer Tastes in a Digital World: The New Players, The New Paradigms, The New Moguls. Wow! All part of day of thought-provoking panels with more than 20 high-profile experts in Digital Media, Traditional Media, Online Video, Web 2.0 producers, platforms and startups in the fields of Fashion, Style, Design & Lifestyle, dissecting who's successful, what's working & where things are headed. CLICK HERE for more. 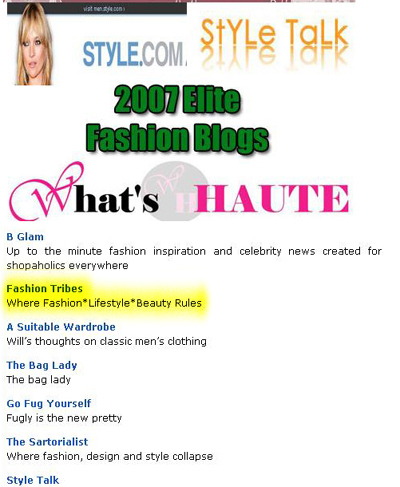 In their wide-ranging roundup of the best lifestyle blogs for 2007, Elite Choice ranked Fashiontribes amongst the Top 10 Elite Fashion blogs. 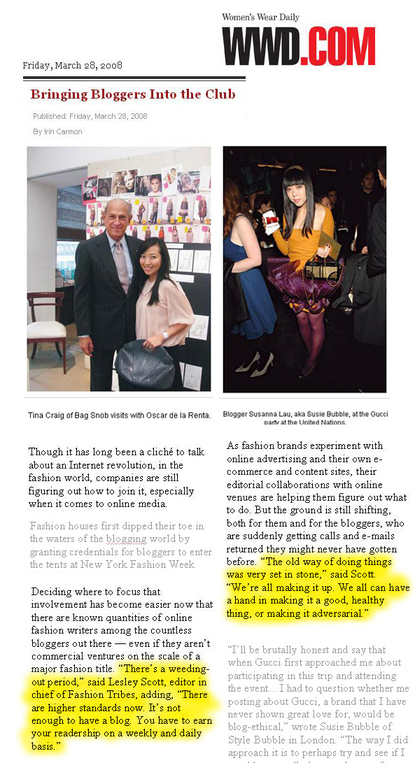 Their charming editor, Zola Marquis, recently did an in-depth interview with Fashiontribes which reveals all! 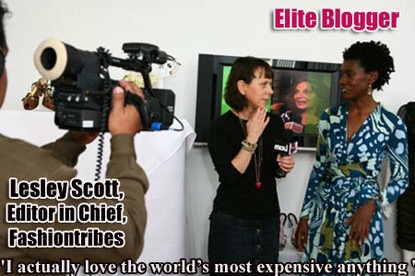 CLICK HERE for the entire Elite Choice interview. Blogged.com is a unique blog directory which is made up exclusively of high quality blogs. Their editors review, rate and categorize each blog, filtering out anything that is outdated, irrelevant, or just plain spam. 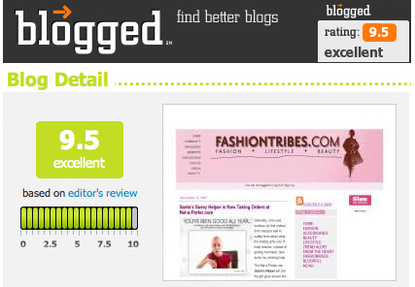 They recently awarded Fashiontribes a 9.5 out of 10 which means they have determined the quality to be "excellent." For the complete rating, CLICK HERE. CLICK HERE for the full the article. 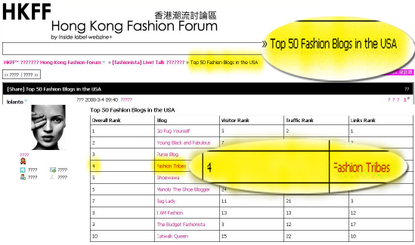 IN THEIR HONG KONG FASHION FORUM, INSIDE LABEL WEBZINE RANKS FASHIONTRIBES AS THE #4 U.S. 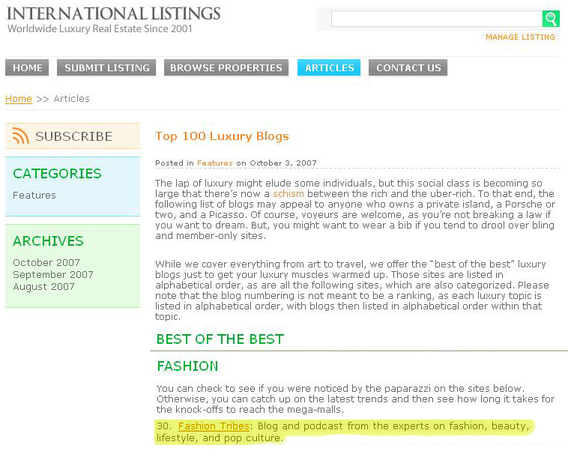 FASHION BLOG OUT THE TOP 50! 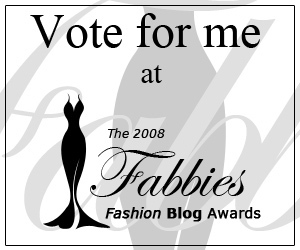 FEBRUARY 2008:FASHIONTRIBES CO-FOUNDS THE FIRST EVER BLOGGER-CREATED FASHION BLOGGER AWARDS - AKA THE "FABBIES"
More than 150 blogs & online publishers from around the world are in the running! For more info, CLICK HERE. NINA GARCIA DOES A FUN FASHION Q&A WITH FASHIONTRIBES! 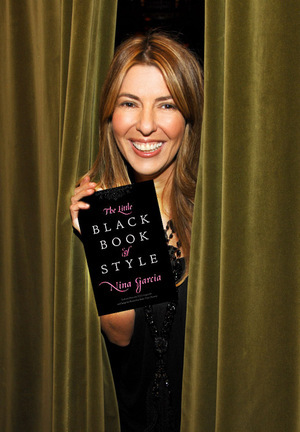 With the recent publication of her well-received book on fashion, The Little Black Book of Style, Project Runway star judge (and former Elle editor) Nina Garcia stopped by Fashiontribes to chat about all things, well, fashionable. Find out what her pet fashion peeves are, how to tell a fad from a trend, and what to pack to look fab on the road...and other chic goodies. CLICK HERE for the full interview. Click here for the rest of the scoop. 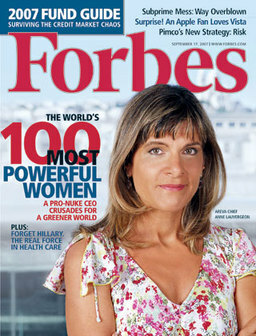 CLICK HERE for the full article & complete Top 100 list. 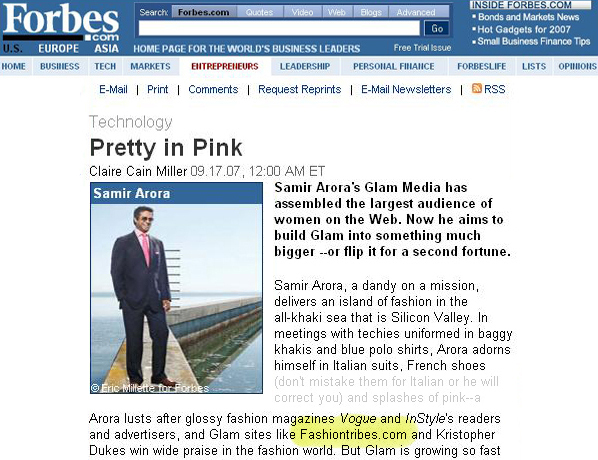 Glam.com recently published Glam Network Stories, sponsored by Canon, featuring Fashiontribes.com & a few other select members of their Online Publishers Network - including Bag Snob & Kineda - who have been able to quit their day jobs to blog full time. For the full story, CLICK HERE. To read the rest of Pretty in Pink, CLICK HERE. For the full list of the Top 50 fashion blogs, CLICK HERE.